Installing a sump pump in your basement is a way of avoiding most flooding issues in your home. As the water rises, the pump removes it. To be effective however, the pump must be located beneath the concrete floor. To do this you'll need to break through the floor to the soil beneath. Breaking through the concrete requires heavy labor and an electric jackhammer. The jackhammer makes quick work of the cutting process, however. Once the hole is cut, you can install your sump pump right away. Contact your local utilities company to identify the location of any pipes running through the area in order to avoid accidentally cutting into them. Locate a spot for your pump that's at a low point of the floor so that the water drains in its direction. Choose an area near an exterior wall as well, to make placing the discharge pipe easier. Place the pump liner upright on the floor in the location you've chosen. Mark an outline around the liner with chalk, and then place a second line around the first about 4 inches away to serve as a guide for digging the hole. The extra space is for the gravel layer around the pump. Put on a pair of safety goggles, work gloves and a face mask. Use a jackhammer to break through the concrete slab inside the outer circle of chalk. 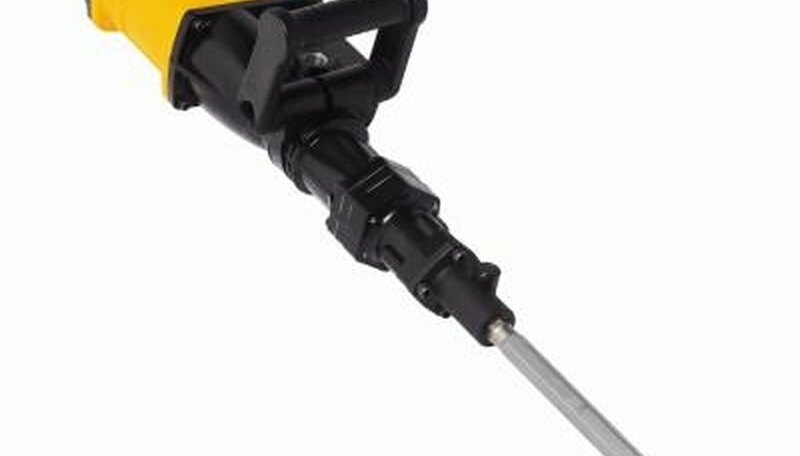 You can rent the jackhammer from a home improvement store or an equipment rental shop. Break up the entire area within the circle with the jackhammer, working from the center of the circle outward. Cut through any steel mesh that may be present in the slab with a pair of heavy-duty wire cutters. Dig the soil from the hole with a spade after cutting through the concrete to a depth of the liner plus 12 inches. Level the soil at the bottom of the hole, packing it tightly with the spade to make ready for the sump pump installation.